A GIANT Vanilla Doughnut Cake filled with luscious Chocolate Buttercream Frosting & Slathered with even more Chocolate. It only serves one right? I have been using Twitter for quite some time now, and I have seen a pattern of how amazing and delicious Giant Doughnut’s are. Of course, right from the off I was tempted for them, and then Lakeland had a sale and the mould was on sale so HELLO! It happened. Twice. I have two of these now! And I am already addicted to them. A giant doughnut is only one doughnut still, which means it still only serves one person. Right? Anyway, I went for plain and standard vanilla cake for my first Giant Doughnut recipe as I like the mix of Vanilla and Chocolate together. 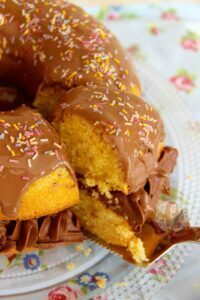 The filling is a light and fluffy chocolate buttercream frosting, and slathered with some melted chocolate for an extra touch. I do admit, I made this on a day where I was still poorly so the photos are pretty poor.. so I apologise, but the cake was definitely a big hit with everyone! I bought my HERE and I am so glad I did, I love the idea of a Giant Doughnut.. Obviously though, this doughnut is not deep fried like regular doughnuts as I don’t own a deep fryer big enough, and baking the cake makes it light & moist. 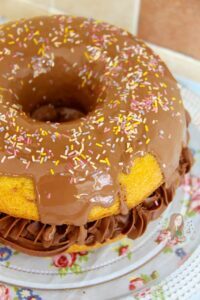 However, if you don’t have the doughnut mould, or you don’t want one but still want to bake this tasty cake, you can bake it in a normal bundt tin (like a nordic ware one) for 35-45 minutes! and then cut in half carefully to make the doughnut style! 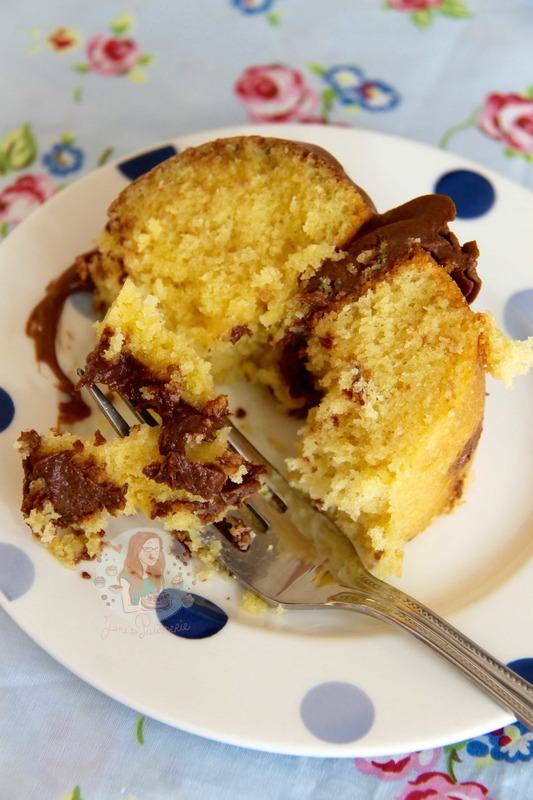 Honestly though, I love this cake, so I’m gonna go bake another one now… yum. This Recipe makes One Giant Doughnut Cake! 1) For the cake – Preheat the oven to 180C/160C Fan and lightly grease your silicone giant doughnut mould. 2) In your stand mixer, with the scraper/paddle attachment, beat together the butter & sugar until light and fluffy. Add in the eggs, flour, and vanilla and beat again briefly till all of the cake ingredients make a soft cake batter. Loosen the mixture slightly with the Milk! 4) For the buttercream – Beat the butter with an electric mixer until it is smooth and loose and then beat in the icing sugar gradually. Add in the cocoa powder and the milk and beat again till smooth and fluffy. Turn one of the cakes out of the mould (so that if you sandwiched them together, the bigger sides are in the middle) and pipe/slather the buttercream onto it. 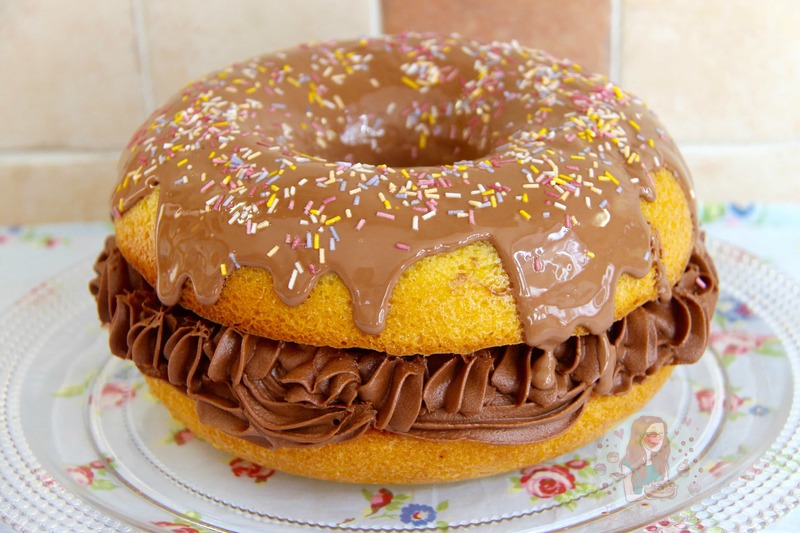 Turn the other cake onto the top of that one, so you have a giant doughnut shape. 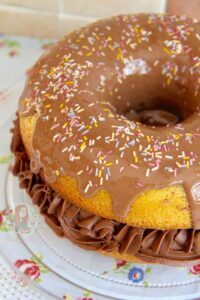 5) Melt the Milk Chocolate and cover the top of it, like a regular doughnut looks like, and sprinkle on some cute looking sprinkles! Leave the chocolate to set, and enjoy! 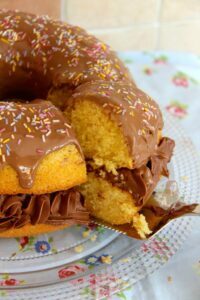 I personally bought my giant doughnut mould from Lakeland as it was on sale for only £2.49 – HERE – but there are others online also! 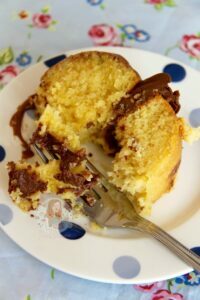 You can obviously just do a plain buttercream frosting for the middle using 125g softened butter, and 250g icing sugar – but I liked the mix of a Vanilla Sponge with a Chocolate filling/covering! Older Next post: Easter Chocolate Bark! Newer Previous post: Spring Pavlova! I LOVE the look of this cake!!! I tried to get the Large Doughnut Mould from Lakeland but they have sold out, do you have any other recommendations? My other half really wants me to make this for him! Also I don’t have a stand mixer, can I make this cake without one? How do I improvise? Aah thank you so much Kristy! !